Last edited by TopEndS62; 07-21-2009 at 08:35 AM. I seen some dominican kid up in Harlem sporting S500clk combo badges on a old school SEL . When u dont know u dont KNOW !! last night my wife sends me out to Target to pick up a few household items. I park kinda off in the distance by myself as i normally do. When I came out of the store I see someone went WAY out of their way to park next to me. From the distance I could tell it was also an E class and could see the quad tips on the back. As I started to get closer to it I notice something doesnt quite look right about it. 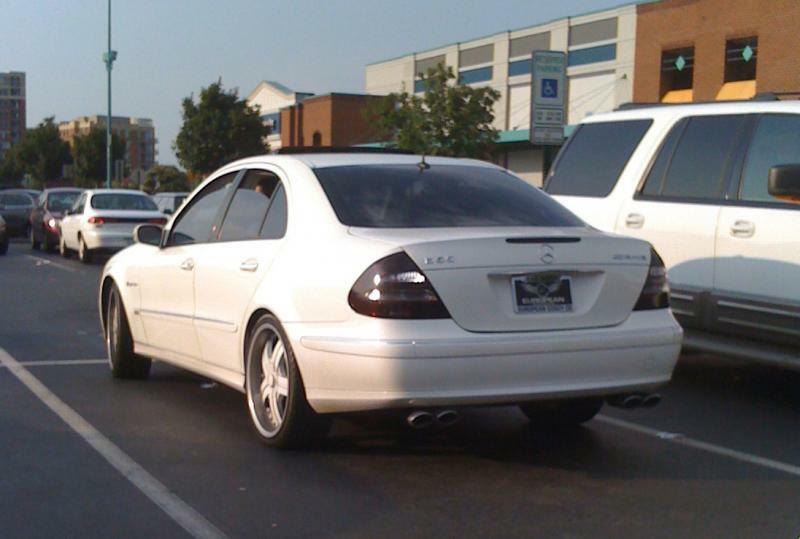 Tips on back were kinda off, wheels looked kinda thin, suspension seemed a little high, but it was badged as e55 AMG. When i get to my car this guy gets out of his E class and starts talking to me. I usually dont mind striking up conversation, but by this point I realized this was NO e55 and was itching to call him out. I was pretty sure it was an e320. He starts asking about my ride and i was happy to give him the grand tour around the vehicle. I then start checking his car out and he then tells me its NOT an e55 though he had it badged that way. I asked him why...he replied, why not? I was trying to be as nice as possible cause I didnt want to start something with him. He seemed genuinly nice and I had to spend about 5 minutes explaining to him why he shouldnt do that. Makes the rest of us AMG's look bad when he looses a race for trying to pose. Long and short was I left on a freindly note, but must say it is dissappointing seeing every other E class out there with AMG badges not being legit. I hope i got through to him and he removes the e55 part atleast. So I goto leave and let him hear what a REAL AMG sounds like. I wish I had taken some pics, but didnt want to do it since he was right there. I really hate the AMG posers! Makes us all look really bad! ...I was trying to be as nice as possible cause I didnt want to start something with him. ...I wish I had taken some pics, but didnt want to do it since he was right there. The world is too small to make enemies...next time the car is sitting out in the open, there is always the <possible> ridiculed jerk that messes with the ride. Last edited by markabcls55; 07-21-2009 at 11:18 AM. They did, it's called the "Sport" package. And it comes complete with a "Sport" badge on the trim of the front fender (above which the real "V8 Kompressor" would go). I floss and errreeyyyythaanng but not in 105 degree weather. You even floss while racing. Two birds, one stone ya digg?? 2. Black E320 WAGON poser driving through Olivenhain - it looked way too high and the wheel/tires were pretty skinny and that was the first clue. Not trying to go back and forth with you, honestly its a very interesting topic(as i am new to owning a mercedes). However like I said before, I've seen many w211 with "sport" on the fender molding without amg bumpers and steering shifters... So I'm confused are there 2 kinds of sport? There are 4 kinds of body kits with Original Mercedes. - Sport, Sport Emblent on the side fender, bumper similar to Classic. - AMG pakg, Front and Rear bumper is same as E55, no side skirt, Dual exhaust Not Quad Exhaust, Sport Emblent on the side fender. Came across another one today. I was in a REALLy big hurry to get home but had to stop at the grocery before doing so and what do I see up front. What appeared to be an e55. As I started walking by the front of it something didnt look right. Not sure how I immediatly spotted the phony AMG but something was wrong with its stance. Then I notice the side markers were REALLy high and out of place. I ran into the grocery and ran back out but thought to myself I wanted to walk behind it on the way out to get a second look. The owner was at the car loading his bags. I look at the exhaust tips and notice the phony quad tips on the back of what appears to be a regualr E bumper. These were DEFINETLY FAKE tips. you could see the Y shaped tips coming off a single outlet going to the duals on each side. This car sat REALLy high. like a e320 or something. Not gonna comment on his race, kinda irrelevant, but as I walk by I said to the owner, nice e55(being sarcastic) and shake my head as I walk by. Hes like "Thanks!" Obviously not clueing into te fact hes been called out on his phony ride. I get back to mine and start pulling out and come up directly behind him and snap this photo. Sorry for the crummy photo from my cell phone. He had some kinda temp tags on it. I really hope he was SOOO STUPID to buy this thinking its a real AMG. Who knows. But take a look at this thing. As I am snapping the photo he notices me in a real AMG and just waves. Another frickin poser in Northern VA! With AMGS plumeting anyone can get one now. It's lost all status too me. I am seeing guys coming in this forum getting out of camerys and right into amgs. For me, its started with a C240 back in 01 and I worked my way UP the ladder. Then when I had my C32, they put out the C230K Sport with the AMG kit and I wanted to die. Get a Porshce GT3 or a F car if ya want to think your car is unique, otherwise it's a Mercedes. I sold some of my extra RENNTECH and AMG badges to ebay guys ready to pose. I think it's funny, it's fun to sweep attack them on Hi-way. When people start to play with badges just to make their car look like something it's not and just to get attention, that's where it gets weird, imho. Same people who buy counterfeit watches, bags, shoes, etc.. Hey, look at my Alden labeled cordovan shoes. Yeah, I know they aren't really Aldens and they aren't made of Horween cordovan leather but maybe nobody will know and it makes me look cool. Funny. For years, I've been removing the badges and was happy when the technology moved from metal on studs to plastic with trim-tape. All except the 300d I had. He's offering codes to change the Command display to show AMG. All you have to do is search this site and find it for free, I guess there are suckers born all the time. See, that's the problem though. You've just (unintentionally) justified his fake purchase. He can now go home believing he's fooling the world while saving 50K, all thanks to your compliment! maybe, but if he clued in looking at me I was shaking my head "NO NO" the whole time I was complimenting. I just think he was too dumb to notice. The fact he's a moron is evident from his crummy 350 badged as a 55AMG. I don't think anybody has said that. fwiw, I owned an E350 with the AMG package. It's the only way it came in the US last year. But no AMG label on the rear and no side fender badging. Again, just like the 3ers with sport package: small M logos on wheels, steering wheel, but no obvious M3 badging like in a true M with the M works motor. But this thread is about putting on their own AMG badges to fool people, not what comes from the factory.